If you'd like to learn more about playing cards, these books provide a solid foundation for study, with detailed histories on the development and evolution of playing cards and card games, many with beautiful full-color photos and illustrations. A well-researched, thorough and informative guide to the history of playing cards. Includes an enormous annotated bibliography of more than 900 items on playing cards and games, and over 1,400 illustrations. Praised by The New York Times as "the most authoritative and complete treatment of its kind." This 332-page volume (plus 24 in color) is based on Gene Hochman's The Encyclopedia of American Playing Cards which was originally published in six parts between 1976 and 1981. A complete cataloging of American playing card makers as well as details, types, and brands of playing cards from the late 1700s to the early 1930s. 2,700 black and white illustrations, 324 color illustrations, Index. This Limited edition of 500 is signed and numbered, hardcover. There are very few families who don't own at least one deck of cards. The hearts, clubs, spades, and diamonds are a familiar sight to all of us. In fact, the use of playing cards has a rich history that dates back to the late 1300s. 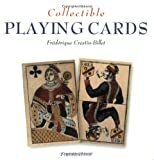 This volume features cards from all over the world; from the familiar format used for playing poker and bridge, to cards used by fortune tellers, to unique round packs from India. Showcasing over 400 different designs, Collectible Playing Cards takes the reader on a fascinating journey through history that spans the globe. Play Your Cards! is a beautiful, full-color book featuring a wonderful selection of rare playing cards, games, and game boxes from the collection displayed in 64 full-color plates of card games dating from the Civil War to the present; Native American playing card decks painted on rawhide; the first card deck to feature a joker; examples of one of the earliest known baseball card series with playing cards (1888); Victorian Game Compendium, sterling silver card holders, and Napoleonic bone boxes made by French prisoners of war between 1790-1814. Also included are Civil War cards, hand colored tarock decks, Minchiate cards, transformation decks, and many unusual, early playing cards. By Stuart R. Kaplan.